Carpet cleaning can be expensive especially when you are wanting to get more then just a couple of rooms cleaned. Most professional carpet cleaners start anywhere from $75 to $99 even if it is just for one room. This dollar amount may seem high but when you think about it the carpet cleaners have to pay for fuel, labor, and chemicals so it makes since why there is such a high minimum charge. However, with most carpet cleaners there are also other untold fees that surprise you when they arrive and if you want all your rooms cleaned you are looking at a high carpet cleaning ticket. Then if you have stairs or want deodorizer that is an additional cost. Your bill quickly runs high and becomes more then you budgeted for. If you are wanting or needing carpet cleaning but don’t want to break the bank use Beyer Carpet Cleaning. They are professionals who charge half the price of some of the bigger competitors in San Antonio. Like most carpet cleaners Beyer Carpet Cleaning does have a minimum charge of $99 so if you want one room cleaned it will cost $99. However, unlike the competitor you can get your monies worth. 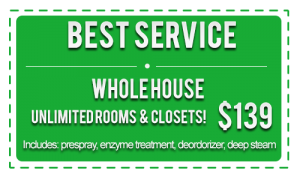 For $99 you can get 3 rooms and a hall cleaned which will include a steam clean, vacuum, enzyme and emulsifier prespray for stains, and FREE deodorizer. Now thats a deal everyone can like. If you have more then 3 rooms and a hall Beyer has you covered. For an additional $40 you can have as many rooms, halls, and closets cleaned up to 2,000 square feet of carpet. Now that’s a bargain you can’t refuse! There is no one other carpet cleaner in San Antonio that can or will give you a deal as good as this. 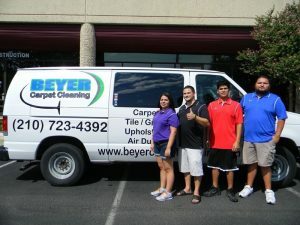 Beyer Carpet Cleaning is always giving their customer as much as possible for not a great deal of money. Beyer gives as much as they can at a reasonable price because they know how hard you work for your money. They also want you to return time after time because you know you’ll be getting a carpet cleaning deal of a lifetime when you use Beyer Carpet Cleaning. Beyer Carpet Cleaning is so affordable it can fit anyones budget.